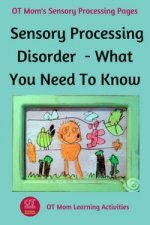 A sensory box can be a very helpful resource for a child who has sensory processing disorder. 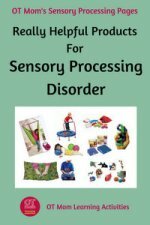 How can a box of sensory items help my child? Basically, a sensory box contains objects that could help your child manage his/her sensory processing issues. 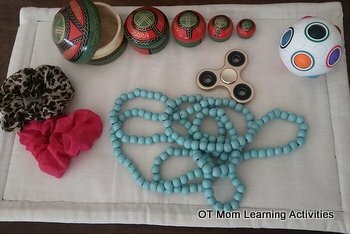 If your child tends to get over-stimulated easily, then the box could contain objects that could help your child to calm down and modulate their over-aroused state. If your child tends to be lethargic and under-responsive, then the box could contain objects that could help stimulate the senses and help him/her to focus. 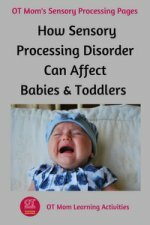 If your child tends to be sensory seeking, then the box could contain objects that could provide sensory stimulation in a way that is acceptable for the situation - such as being able to sit and listen to a story while fiddling with an object from the sensory box instead of bouncing on the furniture! Once you find out which items work best for your child, consider putting one in your handbag and in his/her pocket, so that you always have something at hand to help modulate any sensory issues. 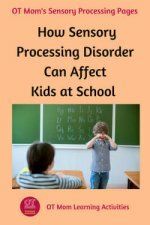 Read my page on sensory processing disorder for more information about these categories. 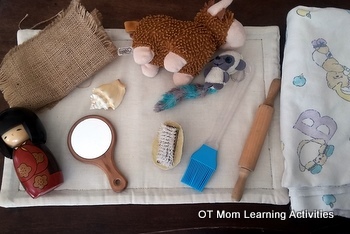 There is no standard recipe or instructions for putting together a sensory box - you will need to discover what your child responds well to by observing your child, talking with your child, and getting feedback from therapists and teachers who are involved with your child. You can make your sensory box fit your budget, and make use of the resources you already have on hand at home. 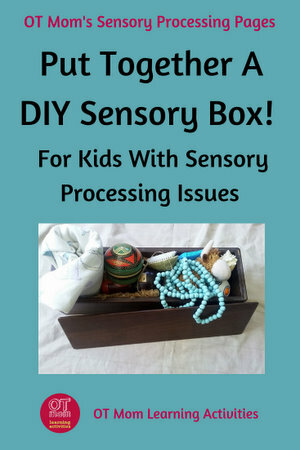 Many sensory boxes on the market contain mostly plastic items, which is why I feel that a DIY box with a variety of household objects can be more helpful. Important - always consider the age of your child and their developmental stage - avoid objects that could be a choking hazard for your child.Also avoid objects that break easily or have sharp edges. Where to use it: You can keep the sensory box in a quiet corner of your house, where your child can go to "unwind" , calm down or get focused. You can also keep one or two items on hand in your reading corner, where you child can use the item to stay focused while listening to you read aloud. Look for items that have various textures. Some children find it soothing to hold or play with something soft and fluffy, while others find rougher textures more pleasing. Rougher textures can also provide great tactile input for sensory seeking kids. You may find that your child enjoys stroking an item, or rubbing it on the hands, arms and face. Smooth wooden objects (wooden doll, toy rolling pin and wooden mirror) - these are heavier than plastic objects, and smooth wood is warm and soothing to the touch. Rough textured material (hessian, corduroy, textured soft toy) - running your fingers or hands over rough fabric can be helpful. Soft textured material (fluffy soft toy, baby blanket) - there is a good sensory reason why most baby soft toys are soft and velvety! "prickly" objects (nailbrush and sea-shell) - like with the textured material, prickly objects can help a sensory seeking child focus. You can even try velcro - some teachers put velcro patches (the rough side) under a child's desk to give the child something to rub the fingers on while listening in class! The silicone pastry brush is an odd addition, but some of my kids enjoyed brushing the soft bristles over their hands and arms! 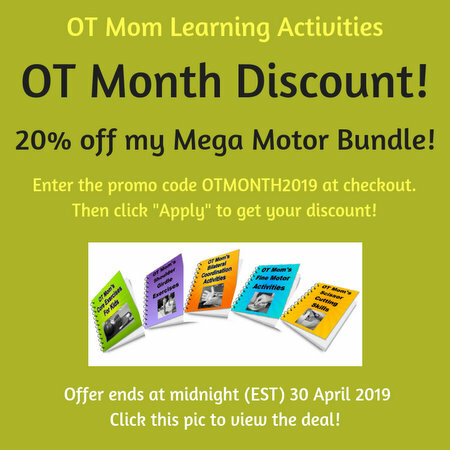 These items are helpful in that they can provide some proprioceptive input to help calm an over stimulated child, or they can provide the necessary stimulation needed to help a sensory seeking child to focus during a listening activity. Beaded necklaces (especially wooden beads) - warm and smooth to hold, it is soothing to let them slip through your fingers. Wooden nesting toys - take the nesting pieces apart and put them together again. Fidget spinners - look for metal ones that are a bit heavier than plastic ones. Spinning them is soothing to watch, as well as fiddly. The slight humming noise may be calming, but some fidget spinners are noisier than others! Hair "scrunchies" - the elastic is safely encased in fabric, so you child can stretch, pull and twist the elastic to his/her heart's content. Puzzle balls - these require the child to push the little balls into place, which works the hand muscles, giving proprioceptive feedback. However, the clicking noise may drive some parents a little nuts while it calms their child! You can also view the Fidget Puzzle Ball on Amazon. PFOT also stock a great variety of sensory fidgets as well as other items that can be useful for kids who have sensory processing disorder. I will earn a small commission which helps to support my site! Thank you for visiting! 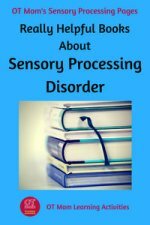 I hope you found this page helpful and were inspired to help your child with sensory processing issues! Why not sign up for my occasional newsletter to stay in touch with new pages on my site?